Emily Stalder Johnson is an emerging author who is passionate about writing Christian fiction to inspire and encourage her readers. An avid reader and writer for most of her life, she also enjoys creating Christian contemporary song lyrics and selling them. Emily lives in Lancaster, Ohio with her husband and roommate (who is much more like a brother to her), and their little zoo consisting of three cats and two dogs. 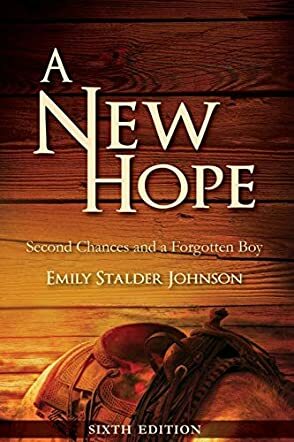 A New Hope: Second Chances and a Forgotten Boy by Emily Stalder Johnson is a Christian fiction novel set in America in 1878. While out riding, Andrew Caldwell comes across a man whipping a 14-year-old boy. The youngster is Dublin Pearson and his father is punishing him harshly for his latest misdeed. Andrew intervenes and rescues the boy. He takes Dublin home to his farm, patches him up and offers him a safe haven. It turns out that the boy has been very badly treated by his father since the death of his mother four years ago. During that time Dublin turned away from God and struggled with his faith. Is Andrew going to be able to help Dublin and steer him back on the right life path? This novel is an honest and heartfelt story of a young boy who suffers at the hands of his father and loses faith in God. He finds a good home with the kindly Andrew Caldwell, who provides the love and guidance he needs. A New Hope: Second Chances and a Forgotten Boy tells a strong moral story steeped in Christian principles. It combines simple, straightforward prose with deeply distressing and complex family problems, including domestic violence and alcoholism. There are many lessons to be learned from the narrative including how a poor upbringing can affect a person later on in life. Those who love adventure and horses will find both woven in amongst the strong spiritual message. It is a family drama that, although set in the 1800s, is one to which people today will easily be able to relate.